Pitfall! has certainly been through a few different incarnations in its long history. The latest version of the game is an action/runner on iOS that sees Pitfall Harry fleeing from an erupting volcano. Remind you of anything? Pitfall! is a sort of return to form, reboot for the series. The second I fired it up, I was brought back to the original game from years ago- and happily so. Most of the Pitfall games since the original Atari 2600 version have been action/adventures, this one (though it's not the same) is way more like the first game with its never ending level and survival-like gameplay. 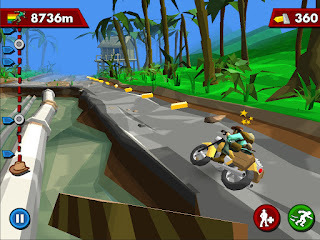 I've never played an endless runner on iOS or Android, but I know that titles like Temple Run are favorites for many. Basically, if you've never played one either, Pitfall! is a kind of eternal running game. The level just goes on and on (though the scenery does change and even randomize a bit) until you make a boo-boo and end up as shish-kebob or get face-planted into a wall. There's no character development, stat upgrades, or (real) bad guys to fight- it's just running. 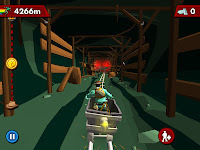 Pitfall Harry automatically sprints forward- your job is to guide him by turning, jumping, sliding, and using his whip. You do get the chance to purchase the occasional power-up, but that's about as far as extras go for the game. It's a lot more fun than it may sound. Sure it's simple, this isn't exactly Gears of War we're talking about here, nor is it the Pitfall games from the SNES or PSOne generations for that matter, but two things about that- it's not trying to be, and it's got a soul and flavor all it's own. Part of what makes the game so much fun to play for a minute or an hour are its easy to master controls. Controlling the action is simple. With a swipe left or right, Harry can turn (on the run) at different junctions. Swipe up or down and he'll jump over or slide under obstacles. Tap and he can snap his whip at snakes and scorpions that lie in wait on the path ahead. This easy control style with no (virtual) buttons lends itself extremely well to the game and really makes it a fantastically addictive experience. 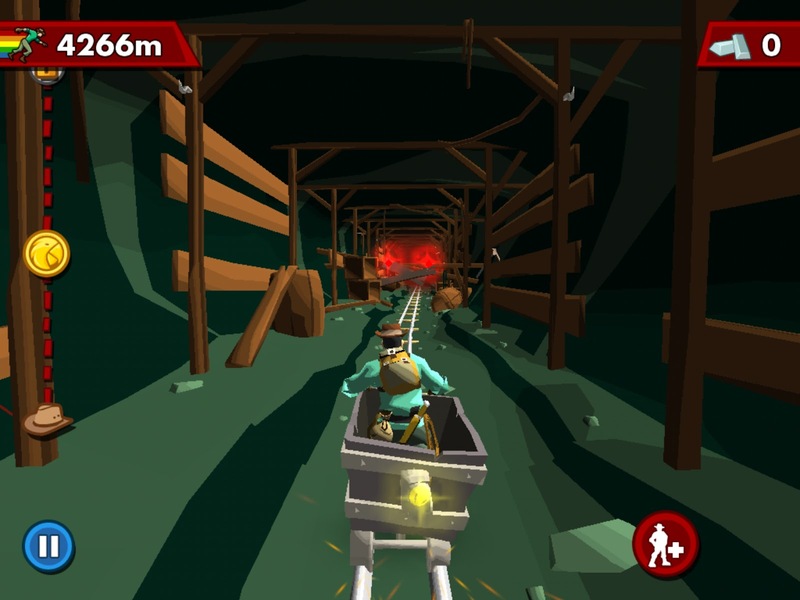 I'm not much for something this shallow all that often, but it's sheer ease of play and the unique look that Activision (and their new mobile-centric studio The Blast Furnace) went for make it very easy to get lost in for way too long. I know the game might not look like much in screenshots, actually it looks drab and without much in the way of detail, but that's kind of a shame that it looks so dull. Once you see Pitfall! moving, you can really get a feel for the charm that the graphical look has. The only way I can think to describe it is to say it's kind of 'old school meets new school'. If you ever played a game on the old Atari 2600, which is where the world first met Pitfall some 30-odd years ago, then you know what its games looked like. Pitfall! on iOS looks much the same (with more detail obviously), but in a three-dimensional gamescape. It's a great look and a definite throwback to the Atari original. I hope The Blast Furnace keeps it around for future installments. 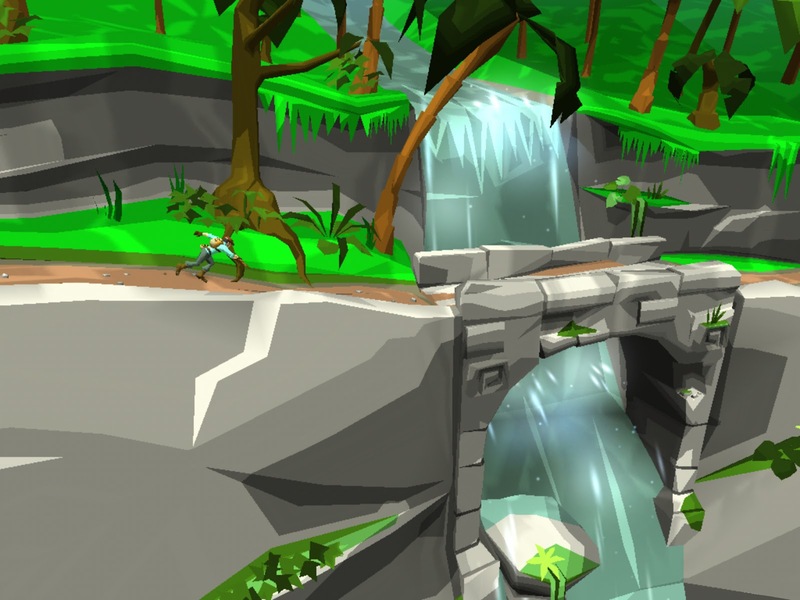 The more I played Pitfall!, the more I found to like about this reboot of a classic. Sure it could probably be argued that there was a lot more that could ave been done if you were going to go about reviving a classic like this, but I can't find too much fault with what's been turned out. And honestly, with this being the game's first new title in a long time, it's just nice to see it back. Pitfall! on iOS is an easy to play, visually charming game. And as a pick-up-and-play experience, it's wildly addictive- now, where'd I put my whip? 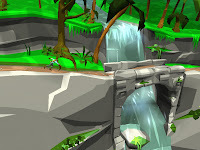 Item Reviewed: Review: Pitfall! (iPad) 9 out of 10 based on 10 ratings. 9 user reviews.